Congratulations! You have found the person you want to spend the rest of your life with! I am sure in the frenzy of planning a wedding (with help from LongIsland.com’s Wedding Page) that the last thing you want to worry about should be how to make it legally official. So, here is your judge to getting a marriage license on Long Island. 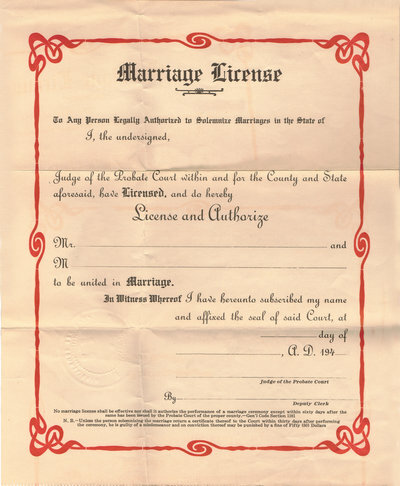 What is a marriage license and how is it different from a marriage certificate? A marriage license is a license that allows you to get married in New York State. Your marriage ceremony must take place in New York State by a mayor, former mayor, former city clerk, a marriage officer appointed by the town, justice or a judge of a court, town justice, county justice, a member of the clergy or minister who has been officially ordained, a member of the clergy or minister who is not authorised by a governing church body but have been chosen by a spiritual group to preside over their spiritual affairs, and other officiants as specified by Section 11 of Domestic Law.The officiant does not have to be a resident of New York State. Ship captains are not authorized to perform marriage ceremonies in New York State. A witness for each party must be present at the ceremony; this is necessary so the person can stand witness in a court of law to affirm that a marriage ceremony took place. A marriage certificate certifies that a couple has been married by a party in the previous paragraph. This is usually submitted by the person who preforms the ceremony. To get married in New York State, you must be over the age of 14. To get married at 14 or 15, you must have parent permission as well as written consent from a justice of the Supreme Court or a judge of Family Court with jurisdiction in your town in which the application is made. If you are 16 or 17, you would just need parents to sign consent when filing for the marriage license. The cost for a license is $40. Depending of your township, you might be able to pay by credit card, but some townships only accept cash or check. Check with your township before venturing out. New York State has provided a pamphlet with information about getting married in New York. Yes. Although you will be issued a marriage license at the clerk’s office, your ceremony can only take place 24 hours after it is issued. You will then have 60 calendar days to get married. After, the license is no longer valid. Ok, So Where Do You Go for a Marriage License? Those who want to get married in New York State have to apply in person at any town or city clerk in the state, generally the one you or your significant other live in. Before venturing out please review your town’s requirements. Some towns require multiple forms of identification. Monday to Friday 9:00 a.m. to 3:15 p.m. Both location times: Monday to Friday 9:00 a.m. to 4:45 p.m.
Monday- Thursday 8:00 a.m. to 4:30 p.m.
After 4:30 p.m. needs appointments. Tuesday through Friday: 9:00 a.m. to 4:30 p.m.
Tuesday and Thursday 8:30 a.m. to 4:00 p.m.
Monday to Friday 9:00 a.m. and 3:30 p.m.